For the past few days I have been neglecting my blog and not really keeping up with whats been happening in our lives. 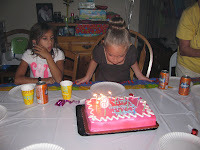 I have not even posted pictures of Kayla's 6th birthday. This was last Aug 30, 2009. We had a surprise birthday party for her, she had no idea since she was at her mommy's and she was just picked up by Ralph. 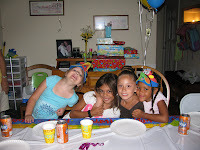 Her friends were already at the house by the time they got back and we all stayed in the dinning room to surprise her. She was shocked and so happy to see her friends and that we were celebrating her birthday. It was not a big party whatsoever since it was going to be a school day the next morning but it was enough for the celebrant and her friends to have some fun. The birthday girl blowing out her candles while her sister tried to blow with her from the other side of the table,lol..
From( L-R ) Kelly, Tracy, Kayla and Tamara. Even if it was just about 2 hours she still had tons of fun and had a great time with her friends. We love you Manang Kayla (big sister) and hope you stay as beautiful and as good as you are. Beautiful pictures! I always get so emotional and excited at the same time when my kids have a milestone. She looks like she had fun. I love your blog and left a blog award for you on my site to pick up. Grabe na jd ka busy nimu mommy lods, wala na update. ka dako na ni kayla no, 6 years old naman d i siya. Imuing kaitlyn lods ba dako na sd sa, mura siya ug tarong oi, mura 22 anyos na jd na bataa. Cute kaayo siya sa iya car oi. What fun photos.. I am happy that your little one had such a nice birthday. They mean so much to kids.